The result is a magnificent, richly detailed two-level main home—the first floor more refined, with an open great room and kitchen, long bar, formal dining area and master suite with adjoined exercise room; the lower “cabana” level defined by a casual, lake house feel and featuring flagstone floors, white-washed alder woodwork, a “Stonehenge”-style fireplace, billiards area, bar and kitchenette, and three bedrooms. The property also sports a caretaker’s loft off the main house and a guesthouse. Though the exteriors of the main and guest houses match—a mixture of weathered granite and 80- to 100-year-old redwood from an old mill and supplied by Yankin’s Reclaimed Lumber—the two buildings have distinct personalities. The guesthouse was built first and the Parkers resided there while working on the main house, which allowed them “to get their feet wet,” says Kielas. 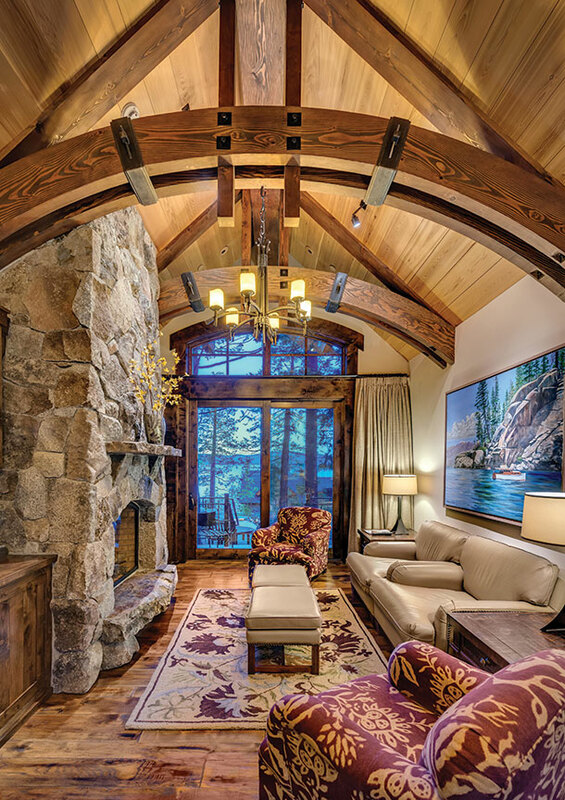 “They could find out what they liked and what they didn’t like.” Dark hickory flooring, a large stone fireplace, interior trusses and distinct details such as the vessel sink, hand-carved and polished from a stone found onsite, all hark to an Old Tahoe style. As construction—and the weekly meetings—continued, the Parkers’ style evolved from the area’s traditional architecture to something slightly more contemporary. Their daughter had just begun college in Boston and the couple bought design magazines from their frequent trips cross-country. Thus, the interior of the main house is inspired by architectural styles from near and far: Layovers in Denver resulted in the picture-frame trim around the windows. A visit to a lounge at New York City’s Plaza Hotel was the basis for the color kinetics light system that illuminates the long bar. “We’d get ideas from other places and modify them a little bit,” says Parker. One such idea was the arches, a theme carried throughout both houses and noticeable even in the front door and wall sconces. Every arch has the same radius, the interior arches concentric with the exterior arches. “It’s not just slapped up,” says Kielas. “Everything has a relationship.” Parker got the idea from an estate he once visited in Rome: From a keyhole, one can look through the house; the arches align and, miles away, frame a view of the Vatican. At the Parker residence, when the doors are open, one can look from the arched gate at the street, the view aligning with the arch of the home’s front exterior, the three arches of the great room and the arch of the back window, ending by framing Parker’s buoy in The Lake. “All are symmetrical and all flow together,” Parker says. It’s these rich details—abundant throughout the property—that make the Parker residence truly outstanding: A soaking tub in the master bathroom is cradled by a unique square log base. Wood grains were meticulously matched even in mitered corners for a continuous look. 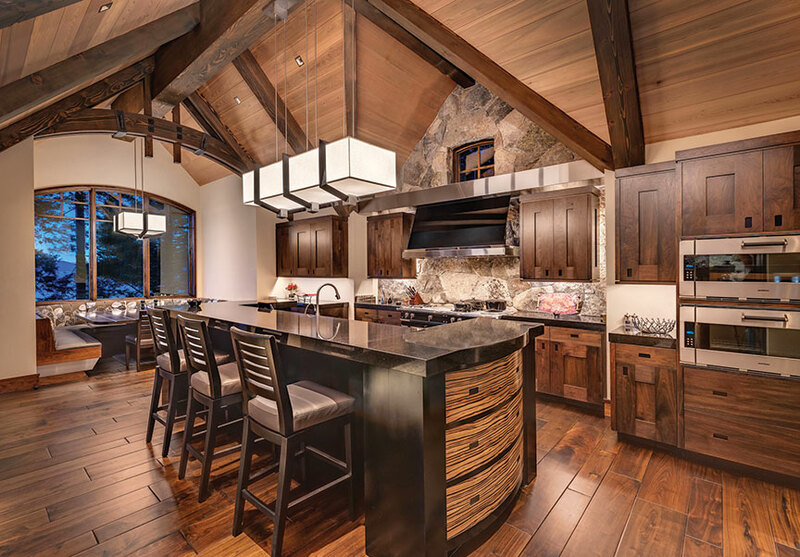 Grass Valley’s Fred Quinterno custom-designed the cabinetry using walnut and zebra woods; Quinterno also designed tables, beds and other furnishings. The tilework, to include the showers made of granite slab inlaid with tile accents, as well as the vanity sinks, are by Hazel Tile & Granite in Verdi. 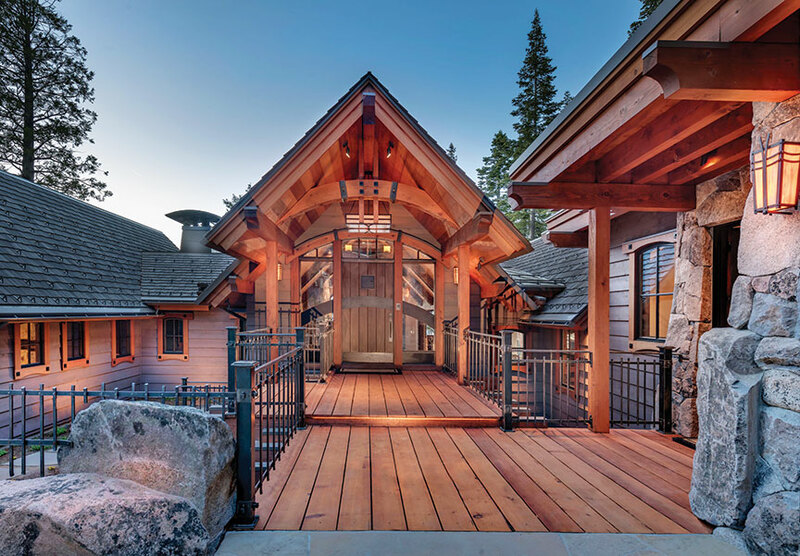 Stonework was completed by Truckee’s Johansen Masonry. In the great room fireplace, the stonework is so precise that it looks almost dry-laid. Exterior rock walls are carried inside as an accent wall in the master suite and in several guest rooms, as well as a backsplash in the kitchen. On the cabana level, the interior flagstone that butts against the patio door matches with the patio’s exterior stones—a detail that wouldn’t even be noticed had it had been ignored, but stands out in its execution. “This is the sign of a great craftsman,” Kielas notes. 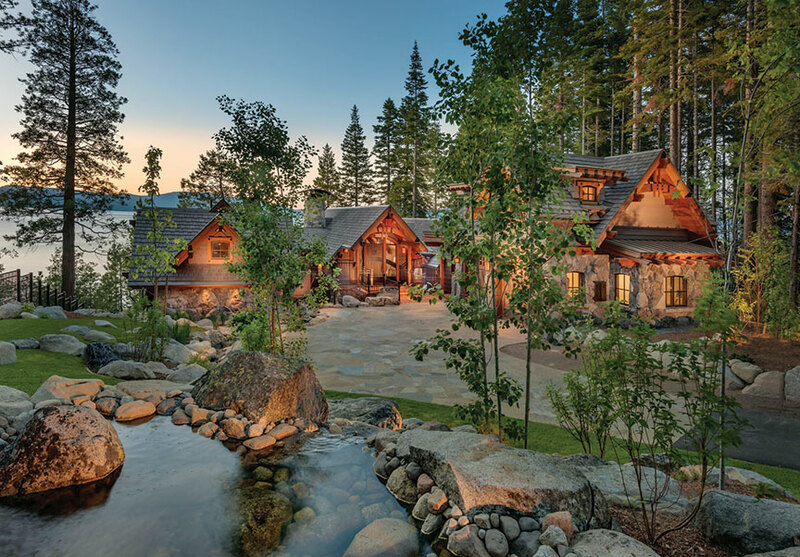 The home’s lakefront location meant adhering to stringent Tahoe Regional Planning Agency (TRPA) regulations. “Scott did a great job on the plans; TRPA didn’t change a thing,” says Parker. Gillespie credits Jan Briscoe, TRPA’s private party consultant. “She navigated the permitting for us and got us our approvals in record time,” he says. It was these principles, the teamwork approach, the enthusiasm of those involved, the visiting and revisiting of every detail, and the efforts by the area’s best craftsmen that makes this one-of-a-kind home so rich and refined. “When someone is this passionate about the detail and really wants to be involved, it gets everyone else more excited about it,” says Gillespie.